rash in our oceans and waterways is one of our planet's greatest, and most preventable, pollution problems. Millions of pounds of disintegrating marine debris was first discovered more than 10 years ago, floating in the Pacific Ocean. The discovery of what is called the Great Pacific Garbage Patch provided a startling wake-up call to the problem of floating marine debris. Since then, trash has been found in every ocean on the planet, as well as in rivers and lakes across the nation. And with the BP oil spill disaster looming in our national consciousness, the health of our country's waterways has become even more paramount. But the good news is, there is something we all can do about it. "Each one of us can get out there and help clean up our coastlines," says Gabrielle Reece, a professional beach volleyball player and wife of big wave surfer Laird Hamilton. This Saturday, Reece will be hitting her local beach with her and Hamilton's two daughters to clean up the coastline. It's all part of the 25th annual International Coastal Cleanup. Taking place on Sept. 25, the event is the world's largest volunteer effort to help protect the ocean. Last year, 500,000 volunteers joined their communities to clean up local beaches, lakes and rivers with a common mission of improving the health of the ocean and waterways. On one day, volunteers removed and tallied 7.4 million pounds of debris, in 108 countries and 45 U.S. states and the District of Columbia. "The ocean is our life support system, yet marine debris continues to threaten its health. From product design to disposal, we all have a role to play in keeping our ocean clean and eliminating marine debris," said Vikki Spruill, president and CEO of Ocean Conservancy. "The International Coastal Cleanup is an essential step to finding solutions," she said. "Data collected by dedicated volunteers inform solutions to the threat of trash in our ocean. By understanding sources of marine debris, we can work together to solve this problem. Join me and communities around the world this Sept. 25 to celebrate the International Coastal Cleanup and a 25-year Sea Change." Event started with cleanup on just one beach : over the last quarter-century, the International Coastal Cleanup has grown from a single cleanup on a Texas beach to a worldwide movement to end the threat of trash in our ocean. In the span of 25 years, the International Coastal Cleanup expanded to include hundreds of thousands of volunteers from around the world who have removed many millions of pounds of trash from the Earth's ocean, lakes and waterways and documented what they found. And now this year, you have a chance to get involved, cleaning up the waterways in your own area. For additional information about the International Coastal Cleanup and to sign up to be a part of the next wave of volunteers visit: www.oceanconservancy.org. What better thing do you have to do this Saturday? 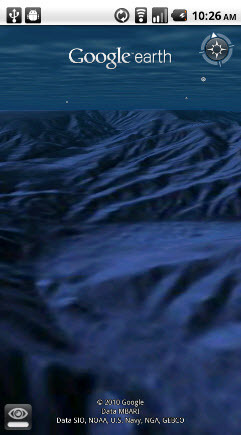 "We recently announced the arrival of ocean bathymetry and ocean layer content to Google Earth for Android. Today, with the latest release of Google Earth 3.1 for iOS, we’re proud to announce that you can now explore underwater landscapes and terrain on your iPhone, iPad, and iPod touch." Dive below the ocean’s surface to explore underwater canyons, or travel to the ocean’s deepest point, the Mariana Trench. You can always reset your view by clicking on the north arrow on the iPad, or on the compass on the iPhone and iPod. As with the desktop and other mobile versions of Google Earth, we’ve also added the “Ocean” layer, which features hundreds of photos and videos from more than 100 contributors curated by the Sylvia Earle Alliance. Google Earth 3.1 for iPhone, iPad and iPod touch is available now in the App Store, or navigate to http://m.google.com/earth in your mobile browser. You can also download Google Earth by scanning this QR code. It’s estimated that as many as a million sharks a year are killed just for their fins. Shark-finning is a cruel practice. Sharks are caught on long lines, or in nets, regardless of size or species. The shark is often stabbed or clubbed, to be less of a threat to the fisherman. The shark’s fins are then cut off and the shark is thrown back into the water, alive, to be eaten by other fish as it sinks to the bottom. Shark-finning has increased over the past decade for a number of reasons, including increasing demand for shark-fin soup and traditional cures, improved fishing technology and improved market economics, according to the conservation group Shark Water. Shark fins go for big money. A single dried fin can fetch up to $300. A growing Asian middle class now has access to shark-fin soup, a dish once reserved for royalty. Cities like Shanghai have multistory shopping centers dedicated to fish and animal sales, which include bin after bin of shark fins. Local Asian markets in the United States and Europe supply shark fins to eager customers. And shark fins are increasingly found in other products such as energy drinks, pet supplies, makeup, vitamins and homeopathic medicines. Laws have been enacted to protect the shark in Hawaii, the Maldives and Palau, which have no–shark-finning zones, The conservation group Sea Shepherd is using new strategies, including sniffer dogs, to fight shark-finning in the Galapogos. Scientists are backing up these efforts. Marine biologist Mahmood Shivji of the Guy Harvey Research Institute at Nova Southeastern University in Fort Lauderdale, Florida, is using DNA to help law enforcement agencies convict smugglers, and his research has shown that hammerheads from the Atlantic Ocean end up in Hong Kong seafood markets. In its video, Wired speaks to scientists and conservation groups about the severity of the situation and what is being done to fight back. A new breed of super sailing yacht performs so well that it can cross oceans faster than motor yachts and at a fraction of the cost. Combine that with design enabling them to compete in superyacht regattas more effectively and the result is a breed of supersloops – large, single-masted sailing yachts – that many owners feel a natural affinity for, with attractive environmental credentials and a competitive edge. A string of launches and the number of yachts being built makes it difficult to appreciate that the super yacht industry has suffered over the past year, but it certainly has. We are now seeing the results of orders placed before the financial meltdown, but they have determined a new type of high performance vessel. Australian property billionaire Lang Walker’s new 58.4m Kokomo with its 71.3m mast is a good example. Mr Lang is a racing man through and through and owns a string of Farr 40 yachts dotted around the world, so he can compete at a moment’s notice in regattas worldwide. But his new supersloop – the third bearing the Kokomo name – with accommodation for 12 guests and as many crew, is not just a platform for luxury cruising. This is a racing vessel, with America’s Cup-style sails, one of the biggest carbon fibre masts ever built and performance even the world’s top Grand Prix helmsmen would not sniff at. Designed by the ubiquitous Dubois Naval Architects based in Hampshire in the UK and, until recently, the biggest sailing yacht built by Alloy Yachts of New Zealand, Kokomo can sail upwind at more than 12 knots and could touch up to 20 off the wind. Apart from the modest angle of heel of the boat, everything below remains calm and luxurious as the yacht blasts round the race courses of St Barths, Porto Cervo, St Tropez and Palma. Cut-throat competition combined with ultimate luxury is the achievement and owners love it. “We are, after all, in the entertainment business,” says Ed Dubois. But supersloops, which are more efficient than two-masted ketches or schooners, certainly have not peaked yet. A Norwegian businessman is building a 66m sloop, also designed by Dubois, at Vitters, one of the Netherland’s most successful bespoke superyacht builders, who recently bought British carbon fibre yacht building specialists Green Marine. Unlike some of her predecessors, which have multiple decks so the helmsman perches atop a lofty flying bridge, this aluminium-hulled boat is low-profile, streamlined and efficient. The aim is to make her a luxury rocket-speed sailing ship and everything is being done to improve the airflow over her enormous sails, especially her headsails. Sails that normally remain furled on a fixed stay while another headsail is in use will now be automatically lowered on to storage drums under the foredeck without a single crewman having to go forward of the mast. The focus is not just on performance – but also on safety, because sails weighing up to half a tonne can be beyond the handling ability of mere humans. Between them Vitters, build managers MCM, Southern Spars and Dubois have come up with the technology to achieve this. Another vast yacht about to emerge from New Zealand, again built by Alloy Yachts, is the Philippe Briand designed ketch, Vertigo. The owner would have opted for a sloop but the yacht had to be able to get under the Bridge of the Americas spanning the Panama Canal which has vertical clearance of just over 61m. Vertigo is 67m long and even under power has a 2,300 nautical mile range at 17 knots increasing to 4,000 miles at 12 knots. This easily exceeds the ability of many motor yachts. Her vast mainsail and mizzen sails would extend the range. To reach shallower anchorages her deep keel can be lifted using hydraulics but when fully down at 9.5m it combines with her sailplan to produce a searing performance, while guests can relax in the deck saloon and extensive accommodation designed by Christian Liaigre who was charged with producing an atmosphere of “urban at sea”. In another example of the breed, a ketch – Panamax – so-called because her twin masted rig is sufficiently short to allow her to pass under the Bridge of the Americas, is being built for a German industrialist. This 200ft flyer is being built at carbon fibre specialists Baltic Yachts in Finland and, when launched next year, will set another benchmark in sailing performance. Another type of super yacht whose design has been driven by the attractions of competition is the J-Class classic sailing yacht. Six of these are already afloat, including the largest and most recent, the 44m Lionheart. These stunningly beautiful throwbacks to the 1930s are making a comeback with two more, Rainbow and Atlantis under construction and a further two, Svea and Yankee, mooted. There could be eight on the start line in UK regattas in Falmouth and Cowes in 2012 to coincide with the London 2012 Olympic Games and they will be joined by a fleet of super sailing yachts in a special event in Cowes. Once again Britain is looking forward to hosting some of the finest sailing yachts in the world at events playing an important role in fuelling the demand for larger, faster, more competitive designs. 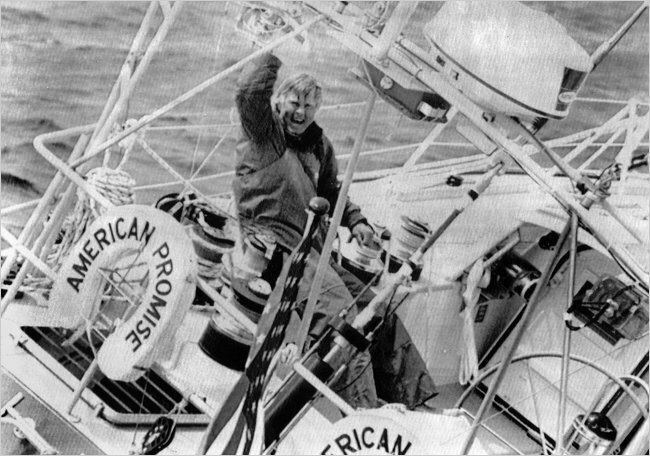 Dodge Morgan, 78, a millionaire who braved fierce winds and endured profound loneliness to become the first American to sail single-handedly around the world without stopping, died Sept. 14 of complications from surgery for cancer at Brigham and Women's Hospital in Boston. Mr. Morgan was the fourth person in history to complete a solo, nonstop circumnavigation of the globe. Piloting a 60-foot custom-built boat, he had set out to break the world speed record -- 292 days, set in 1971 by Briton Chay Blyth -- and ended up shattering it, arriving in Bermuda to cheering crowds on April 11, 1986, a mere 150 days after departing. Mr. Morgan had been bitten by the idea for a round-the-world voyage decades earlier, when he spent 2 1/2 years wending his way from Maine to Alaska aboard a 36-foot wooden schooner. He maintained his sense of wanderlust even as he returned to dry land, where he started and operated an electronics company in his Massachusetts garage. The business -- producing marine radar equipment and popular Whistler radar detectors for cars -- grew quickly, and Mr. Morgan sold it in 1983 for an estimated $32 million. Suddenly, he had the wherewithal to do whatever he wanted. "Various people in this world have chosen to put themselves close to the edge, either intellectually, or emotionally, or physically,'' Mr. Morgan said in 1985 as he planned his voyage. "This is my way of doing it. It may be an overdone way, but sailing a boat alone is such an uncomplicated way to stay on the edge. I think it allows you to sort out what is important in life. I think there are a lot of overcivilized people out there drinking coffee out of a Wedgwood cup." He commissioned renowned naval architect Ted Hood to design "American Promise", a rugged, $1.5 million vessel made virtually unsinkable with watertight compartments and submarine-esque doors. Mr. Morgan armed his single-masted sailboat with the latest in high-tech gear, and he avoided the need for repairs by outfitting it with two of everything: two sets of sails, two rudders, two satellite navigational systems and two machines to convert salt water into fresh water. Sailing eastward around Africa's Cape of Good Hope, skirting south of Australia and South America, Mr. Morgan endured the boredom of becalmed seas and the heaving thrill of tropical storms. American Promise righted itself after being laid flat by wind at least 11 times, according to newspaper reports; once, a gale pushed the boat 175 miles with its sails furled. Even more than a remarkable physical adventure, the voyage became a psychological test of Mr. Morgan's ability to withstand extreme solitude. In five months at sea, the sailor spoke only to a handful of ham radio operators. He saw few passing ships and laid eyes on land just once, when he rounded Cape Horn on Day 108. For company, he had only schools of dolphins, the occasional albatross and about 40 books, including Mark Twain's "The Adventures of Huckleberry Finn." Once, as he crept across the Southern Ocean, a massive westbound container ship slid by on the horizon -- the first sign of humanity for weeks. "Solitude is easier when I am not directly reminded of the company of others," Mr. Morgan wrote in his book, "Voyage of American Promise" (1989). "It takes me hours to rid myself of the lonely feeling the great ship left me with." The journey was recorded via six cameras installed around the boat, and that footage was later used to produce a PBS documentary about the trip, "Around Alone". Mr. Morgan rose every morning at 5:30 to spend the day eating, reading and fixing frayed lines and writing in the ship's log. Each evening, he completed what he called "shrink tests", designed by two Boston College psychology professors who studied Mr. Morgan's response to solitude and sensory deprivation. He woke every two hours during the night to check on the boat. "I enslaved myself to this routine," Mr. Morgan later said. "That was how I managed to cope." Upon reaching Bermuda, Mr. Morgan celebrated with his favorite meal -- a cheeseburger -- and then declared he was "gonna stay ashore awhile." His trip made headlines around the world and was not repeated by another American until 2005. Dodge David Morgan was born on Jan. 15, 1932, in Malden, Mass. He was a toddler when his father died, and he was raised during the Depression by his mother. Mr. Morgan graduated from Boston University, served in the Air Force, wrote for the Anchorage Daily News and headed his own advertising firm before founding the business from which he made his fortune, Controlonics Corp.
After his round-the-world journey, Mr. Morgan settled in Maine, eventually building a home on an island near the town of Harpswell. He bought and later sold two weekly newspapers in Maine and helped start VXI Corp., a New Hampshire-based company specializing in speech-recognition hardware and software. He continued sailing and was in the planning stages for a voyage around Antarctica when he realized, he told the Boston Globe in 2001, that he "no longer had the fire in the belly" for such an adventure. Mr. Morgan's first marriage ended in divorce. In 1972, he married Manny Hoyt, who planned and packaged 280 days' worth of freeze-dried and vacuum-packed meals for his journey aboard American Promise. Their marriage also ended in divorce. Survivors include his fiancee, Mary Beth Teas of Harpswell; and two children from his second marriage, Hoyt D. Morgan of New York and Kimberley P. Morgan of San Diego. After his circumnavigation, Mr. Morgan donated American Promise as a training sloop to the U.S. Naval Academy in Annapolis. In 1991, the boat sank after a predawn collision with a coal barge in the Chesapeake Bay. None of the dozen midshipmen aboard was injured. The boat later returned to the sea after undergoing a years-long restoration. "Anybody who buys a boat buys a dream," Mr. Morgan once said. "Particularly a sailboat. They may never fulfill it, but they always have the option. Someday, maybe." Solar activity continues to increase after a two-year solar minimum that ranks among the century's deepest. The return of sunspots and a resurgent solar wind is good news for aurora watchers, who are seeing some of the best displays since ~2006. With increased solar activity and as the Summer slowly wanes into Autumn, the Northern Lights are beginning to dance across the skies. The Aurora Borealis, also called the Northern Lights, are beautiful curtains of light created when fast electrons from the solar wind slam into the rarefied gas of the upper atmosphere. The mechanism of action is similar to the way electrons in a television generate specks of light when they impact the phosphor-coated inside of the screen. However, the physics of the Aurora Borealis are complex, and not perfectly understood. The energy of certain types of aurora probably derives from a dynamo effect of the interplanetary (solar wind-caused) magnetic field against the Earth's magnetic field. This is similar to the way electricity can be generated by rotating a magnet within an electromagnetic coil. The aurorae are green or faint red in color, produced by re-emission from atmospheric oxygen. Atmospheric nitrogen sometimes produces very faint blue/violet aurorae. Some of the most magnificent pictures of aurorae have been taken from the Space Shuttle or International Space Station, which views the phenomenon from an angle impossible from the ground. The Aurora Borealis is most easily observed about 1500 miles (2400 km) from the Earth's magnetic poles. A southern variant also exists, called the Aurora Australis, but this is rarely observed because it mainly occurs in the oceans around Antarctica. The Earth's magnetic poles are located about 11° away from the geographical poles. In the north, the magnetic pole is located just north of Canada, meaning the Aurora Borealis is easily observable from places like Fairbanks, Alaska. Rarely, during magnetic storms and coronal mass ejections (super solar-flares), the Aurora Borealis becomes much more intense, and can be visible as far south as Boston. In 1856, a coronal mass ejection produced aurorae so strong that one could read a book at night in New York using the light produced. The Aurora Borealis have long been subjects of mythology and superstition. Scandinavians once thought they were produced by the reflections of huge schools of herring. In Scotland, they were called the "merry dancers". Gold miners in Alaska believed they were reflections of the greatest mother lode. Until the advent of scientific satellites, many of the theories about the aurorae were very speculative. Even today, our understanding is not perfect, but is steadily improving. MBARI researchers Bruce Robison and Kim Reisenbichler used video taken by unmanned, undersea robots called remotely operated vehicles (ROVs) to study barreleye fish in the deep waters just offshore of Central California. At depths of 600 to 800 meters (2,000 to 2,600 feet) below the surface, the ROV cameras typically showed these fish hanging motionless in the water, their eyes glowing a vivid green in the ROV's bright lights. The ROV video also revealed a previously undescribed feature of these fish--its eyes are surrounded by a transparent, fluid-filled shield that covers the top of the fish's head.